Perugia is a substantial town located in Umbria, central Italy, on a hill on the right of the Tiber. The Gothic cathedral is of the 14 C, but its façade is still unfinished. 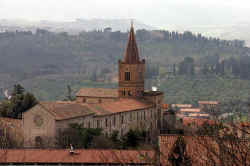 The cathedral contains paintings by Baroccio, Manni and Signorelli. It houses a marble sarcophagus containing the remains of Pope Urban IV and Pope Martin IV. An onyx ring is preserved, traditionally the marriage ring of Mary, in the chapel del Santo Anello. This ring was venerated first at Chiusi, whence it was stolen in the 15 C and taken to Perugia. In the chapter library a 6 C codex of the Gospel of St. Luke is preserved. 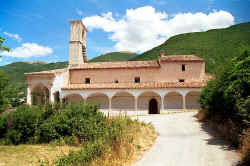 Other churches in Perugia are: San Pietro dei Cassinesi, the church of a monastery founded by St. Peter Vincioli about 1000; San Ercolano, the high altar of which is made of an ancient sarcophagus; Sant' Angelo, a round building, dating from the 6 C; the Madonna della Luce, a graceful little temple by Galeazzo Alessio; San Francesco del Prato, now the seat of the Accademia of fine arts. The university, founded in 1320, has three faculties, and contains a museum of Etruscan, Roman and Christian antiquities, with many sculptures and inscriptions. Among the latter is the "Tabulæ Perusinæ", discovered in 1822. The most notable ancient monuments of the town are the Porta Augusta, the tomb of the Volumnii, which was discovered in 1840 by Vermiglioli, and the Etruscan walls. Perugia was among the most important cities of the Etruscans, with whom it took part in the wars against Rome in 310 and 295 B.C., and also in the Samnite War. The Perugian War (41 B.C.) is famous - the troops of Mark Anthony were besieged and compelled to surrender. During the Gothic War, Perugia suffered various sieges - by the Byzantines in 537 and 552, and by the Goths in 546 and 548. The Lombards had taken possession of the city at the time of their first incursion, but in 592 it again came under Byzantine rule and was made the seat of a Dux. In 749, it was besieged by the Lombard King Rachis, who, however, was persuaded by Pope Zacharias to raise the siege. Pepin gave the city to the Holy See. From the beginning of the 11 C, Perugia was established as a free commune and was periodically involved in conflicts with the neighbouring cities of Umbria and of Tuscany (Chiusi, 1012; Cortona, 1049; Assisi, 1054; Todi, 1056; Foligno, 1080 and 1090). It was governed by consuls who were later by the Priori delle Arti in 1303. After 1174, there was a podestà, and later a capitano del popolo. Perugia was friendly to Florence and faithful to the Holy See, and was essentially a Guelph city. In the 13 C, the popes established their residence here for a long time. Four of them were elected here (Pope Honorius III, Pope Honorius IV, Pope Celestine V, and Pope Clement V). On the other hand, continuing its wars with neighbouring cities (Spoleto, from 1324, was besieged for two years), Perugia extended its sovereignty over the greater portion of Umbria, and over a part of Tuscany. In 1375 it was among the first cities that revolted against Pope Gregory IX at the instance of the Florentines. Meanwhile, two parties had been formed: the Raspanti (the popular party) and the Beccarini (the party of the nobles), and between them they had made it possible for Biondo Michelotti to become lord of the city in 1390. He, however, was killed in 1393, and then Gian Galeazzo Visconti took possession of the town, but in 1403 it became subject to Pope Boniface IX. Afterwards it fell into the power of Ladislao di Napoli. In 1416 the city was taken by Braccio da Montone, who was recognized as lord of Perugia by Pope Martin V. At his death in 1424, the nobles came into power, but contention soon developed among them, and eventually the Baglioni made away with the Oddi family. Finally, Gian Paolo Baglione became a tyrant of the city, making himself detested by his cruelty and dissolute habits. He was brought under control in 1506 by Pope Julius II, but fresh cruelties against his own relations led to his decapitation by order of Pope Leo X in 1520. Perugia then became once more an immediate dependency of the Holy See. In 1534, Rodolfo Baglione set fire to the Apostolic palace, and the vice-legate was slain. No sooner had order been established after these events, than a rebellion broke out on account of the tax on salt, which Paul III had increased in 1540. Perugia declared itself a "city of Christ", and confided its keys to the care of a crucifix. On 5 July, however, it was compelled to surrender to the troops of Pierluigi Farnese and lost its freedom. Pope Paul III built a fortress to prevent further revolts by the Perugians, while Pope Julius III restored to them the greater part of their privileges. In the rebellion of 1848, the first act of the Perugians was to demolish the tower of Pope Paul III. In 1859, a provisional Government established, but the Pontifical troops soon took possession of the city. Finally, in 1860 General de Sonnaz took possession of the town in the name of the King of Sardinia.